Pearl, enamel and 14k gold mesh slide bracelet, by the Newark Group, circa 1870. 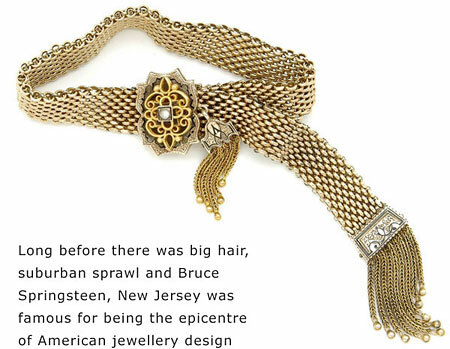 Several historical and social events converged in the mid-19th century to create a jewellery manufacturing centre in Newark, New Jersey, that would become the epicentre of American jewellery design. The building of the railroad, the output of the 1849 California Gold Rush, the continuing effects of the Industrial Revolution and the increasing population and growing wealth of the new genteel middle-class in America, created a market and a demand for affordable jewellery. Several gifted craftsmen of the period began to produce jewellery in quantities for distribution to the growing urban centres of America. These manufacturers, which numbered 200 at one point, settled in the Newark area and became known as the Newark Group. 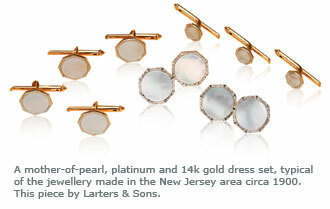 Newark pieces can still be found in private collections, auctions and antique shops. 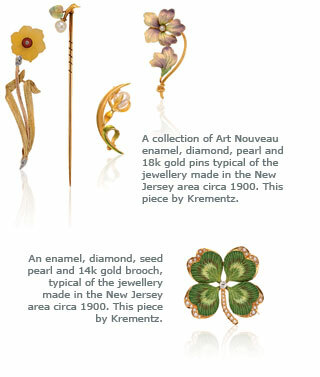 They are often unsigned, with the exception of pieces from Krementz or Larters & Sons, and are stamped 14k or 18k. Other companies in the Group included Ailing & Co., Allsop & Sons and Unger Bros. But the Newark Group’s reputation for excellence was so firmly entrenched that its members, who sold to the finest retail stores in the U.S., were content to sell their pieces anonymously, giving retailers the option of presenting them as their own. Between 1880 and 1930, with the rise of the European-inspired Beaux-Arts and Art Nouveau jewellery designs, the Newark Group’s influence and craftsmanship continued to proliferate across America, and they produced vast quantities of jewellery. Unlike their European counterparts, however, who were producing highly sophisticated and elaborate, expensive jewels for the wealthy elite in Paris, Vienna and London, the Newark Group targeted the growing American middle-class bourgeois market. The Group’s intricate designs were subtly simplified in order to ensure affordability and to aid in the facilitation of commercial production. These beautiful pieces, once shadowed by the important designs from European master jewellery houses, can now be more fully appreciated for their quality and the historical dimension they bring to jewellery design. The Group, which began in 1801 with one or two companies, reached its peak in the later decades of the 19th century, by which time it was producing 90% of America’s gold jewellery. The majority of pieces were in 14k gold, embellished by skillfully applied polychrome enamels and occasional gemstone accents. Newark jewels – some of which can still be found today – were distinguished by their delicate designs and exceptional craftsmanship. It was this high calibre of goldsmithery that led to Newark’s commissions to provide unsigned jewellery to some of the haute houses in New York, such as Tiffany & Co. and Cartier.